Hordes of tourists and natives alike crowd Times Square at any given part of the dayin my case, 7 p.m. on a Monday after work. 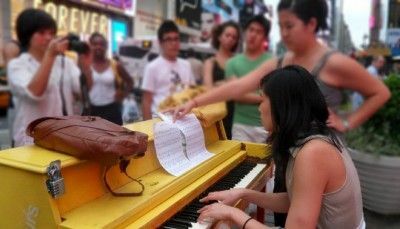 My friends were standing around a sunshine yellow piano located right at the epicenter of Times Square, and a professional pianist was delighting the crowd with his masterpiece. As I listened, my heart sank to my stomach and my hands were shaking. Youre next, Angie, one of my friends said with a nudge. Suddenly this didnt seem like such a good idea. I was one of those children that you had to force to sit at the piano to practice. Sometimes it involved screaming. Eventually I realized the minimal amount I had to practice each week to get by in my piano lessons. Then when I started college, there were no more lessons or practice sessions, and suddenly, I realized how much I loved (and missed) playing the piano. In college, my friend Jenn and I would storm the private music rooms on campus to play all our old classical pieces and attempt some current hits. Later, my boyfriend at the time lent me his weighted keyboard so I could play in my bedroom. This became especially beneficial whenever I felt stressed and needed to let my emotions flow from my head and my heart and out through my fingers. Moving to New York, I had to forego making music. Due to lack of transportation, space, and time, I returned the weighted keyboard and stopped playing. After a few months, I started getting antsy and looking up piano room rentals at local theatres. So when New York hosted a two-week art installation project of free pianos open to the public around the city, I knew I had to play. There was only one problem: stage fright. As much as I love playing, I am terrible with large crowds, something that is unavoidable in New York. When it comes to piano, I view playing as a personal fulfillment and only choose to share it with a few close friends. The thought of performing in front of a large crowd of strangers creates a terrible anxiety and nervousness. Luckily, Jenn happened to be visiting and I told her of my goal to participate before the installation ended in July, and she happily agreed to support me. On our first attempt, we walked in the dead of night to one of the free pianos at Central Park. My logic was this: Its late, so not as many people will be out, and its dark, so they cant really see me. But somehow my logic did not factor in that the piano would be locked during the night. The next day I made my second attempt, more determined than ever. I discovered that there was a closer piano in Times Square, so I decided if I was going to do play somewhere, why not one of the most heavily trafficked locations in the world? Despite my nervousness, and even my mistakes, I sat on the bench and played. I played because I could make music. I played because it made me happy. I played until the piece was finished, the crowd applauded, and I turned and smiled. Shortly before I was born, my parents became small business owners. For some kids that wouldnt change life too much, but I have always been involved in my parents work. Every day after elementary school, I went to the office and sat next to my mom while she finished her days assignments. As I grew older, I started to help by answering phones, collating copies, typing up articles, whatever. Over time, my parents employees became like extended family to me. We even celebrated birthdays and holidays together. So when schools started to promote Take Your Child to Work Day, I just rolled my eyes. I already went to my parents work every day. What was so special about that? Now that Im an adult in the workforce, I can see what a positive impact going to my parents office had on me. I got a lot of experience that people dont get until their late teens or twenties. I saw firsthand what it takes to manage people and operate a business. I even helped manage people and operate the business sometimes. Exposure to a work environment definitely gave me an advantage as an employee. Of course not everyone is going to get the same degree of exposure, but I do think every little bit counts. Through Take Your Child to Work Day, children can witness the value of individual competence and work ethic, as well as team effort and collaborative spirit. Kids can learn that every job is important, regardless of title, because each job affects the others in the company. And most of all, they can see what their parents do, how to balance work and home life, and the value of education. They can begin to form their own professional dreams and goals. These are important lessons for a persons career  and for a persons life in general. So come April 22, 2010, I hope all parents who are able will take their sons and daughters to work. Trust me, theyll thank you for it someday. It started with dirt and some daffodil bulbs. My dad took my sister and I out to plant daffodils in the backyard, and ever since then Ive been fascinated by the earth. My dad continued to foster this interest by taking the family to national parksIve visited over 35 states because of this. When I see the red-orange glow of the hoodoos in Bryce Canyon or the bubbling mudpots in Yellowstone, a sense of awe engulfs me. I continued to develop this interest throughout high school and college. In addition to double-majoring in geography  for fun  I also became active in the Campus Environmental Center (CEC). Through the CEC, I planted trees, worked on sustainability policies that the University of Texas eventually adopted, and volunteered at our campus-wide garage sale that practices the idea of re-use, which has saved tons of items from going into the landfills. Now that Ive begun my career in advertising, people often wonder why I bothered with the geography degree. But I use it everyday! While I am not active in influencing environmental policy, I do what I can to live an environmental lifestyle. I continue to recycle, I use my own eating utensils at work, I eat less meat, and I find ways to reduce my waste. They are small adjustments, but every step matters. I do all this because I learned to appreciate our earth. Which is why, come April 22, Earth Days 40th Anniversary, I hope you will join me in celebrating. Whether you plant a tree, advocate for industry regulation, or just make a small adjustment to your life  like buying one less bottle of water  you can impact change. Lets make that change together! When youre a kid, you dream of growing up. Turning 16 means you have control of your life, as long as you get access to four-wheels and a motor. Turning 18 means you no longer have to listen to anyone but yourself, although if youre smart youll still listen to your parents sometimes. Turning 21 means, for most people, a real party. Personally I dont drink, but its definitely rite of passage for others. But somehow, when you graduate from college and start working, birthdays lose some of their meaning. Really, what happens at, say, 23? As soon as we leave the school bubble, we really do have to grow up. So here I am, employed in my first job and facing the first dreaded milestone in my life: 25th birthday and the quarter-life crisis. My generation grew up believing in ideals: Chase your dreams, follow your passions. These beliefs permeated our actions as we strove to be not only the genius, but also the dedicated athlete, volunteer, musician, etc. A well-rounded generation of dreamers and achievers. Throughout my education I was well-versed in balancing homework, extracurricular activities, and a social life. I could work on a paper, study for a test, and still go out with friends. When it came time to leave college, I cheated the system and went to grad school. Two more years of the school bubble. Two more years to avoid reality. Of course I did eventually make a decision. Ive lived in New York for almost 6 months now, and my whole lifestyle has changed from the laidback Austinite to the fast-paced New Yorker. Im working at a large public relations firm, and I like my job and my team. I like the city for all its sights and adventures, and Ive made new friends. Yet I still feel lost. The quarter-life crisis exists because of this big transition in life. Every idealistic notion I had for the past 24 years was demolished with a diploma and a decision about my career. Many of us face the problem of balancing reality with passion. When we leave school, we have to start thinking about the future, which means we cant spend all our money traveling the world, or else how will we ever afford our 2.2 kids and that house with the white picket fence? Somehow the achiever is still achieving, but the dreamer is dwindling. There is only one thing we can do: recalibrate. I am balancing new factors while slowly building new routines with my passions. Yes, a lot of it revolves around work, but its also some of what I enjoy, like exploring the culinary delights of the city, and becoming a mentor to teens. What Ive learned is that its okay not to know what you want or exactly where youre going. Just try to have a vague idea of where you want to be, and slowly make your way to that general vicinity while trying everything along the way. Youll figure out what you do and dont like, and youll start dreaming again. What I think I want changes constantly, but every day that passes I am learning more about where I want to be. 25 is here, and its not so bad. Im looking forward to everything I will learn and experience as the years pass. Ill just have to keep that in mind when I approach the infamous 40.